Technology has moved us into the digital world of automation and helped us with data, keeping safely, making business reports, financial reports and recording various details in a very short time. At Sara Technologies we strive to bring technology to the doors of health industry through our customized series of various dominant modules of Hospital Management software that comes handy in recording registration of patients, their history, staff records, and billing reports list. This is a boon of cutting-edge advanced technology, then why you will seek help from traditional methods of collecting records? We bring to you an amazing tool in your hands with our Outpatient Management Software (OPDMS) for Hospitals, Nursing Homes and Healthcare Centres. Sara technologies has provided you a great solution with its OPD management software. You can easily record outpatient's registrations, billing details and history of patients. It enables you to access huge data only in a few clicks. OPDMS is a small pocket to put overall data and outpatient details without the tedious task of manual registration and searching it from the huge pile of existing files every time the patient visits. It's a complete software solution for Outpatients registration, treatments, billing and reporting with complete detailed information of out patient. It reduces your paperwork procedure and saves your time. As everything is squeezed in your system you don't have to worry over maintaining various files and documents. All you have to do is enter the personal details of the patient, consultation and hand over an automatically generated registration number to him or her. You can even fix appointments with a help of tool and have a look at the schedule as well. 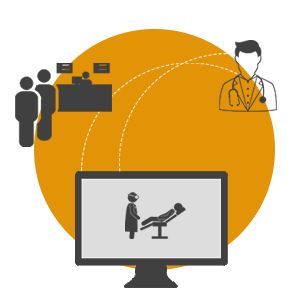 OPDMS allows doctors to electronically prescribe the medicines or tests. The quick view facility lets the doctors to quickly view the historical prescriptions of each patient and move ahead for further treatment. It facilitates doctors to give better cons OPD software module provides an electronic record keeping & data processing, take quick decisions by accessing comprehensive detail of the patient. 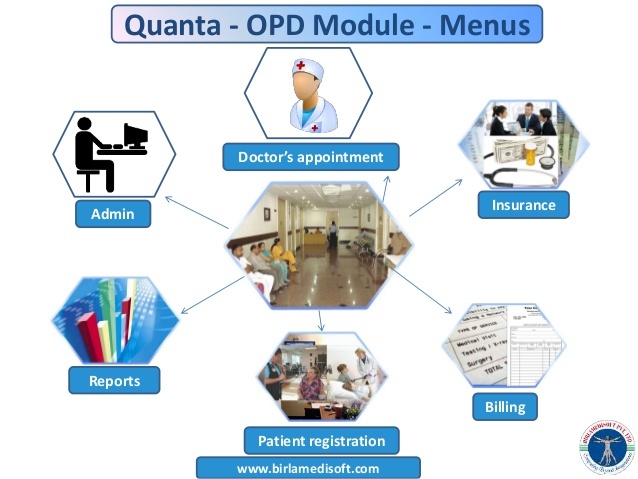 OPD module equips doctors to check the details of all the patients to calculate the cost of all the services rendered to each patient and reflecting into the final billing accurately providing a smooth and transparent billing system. 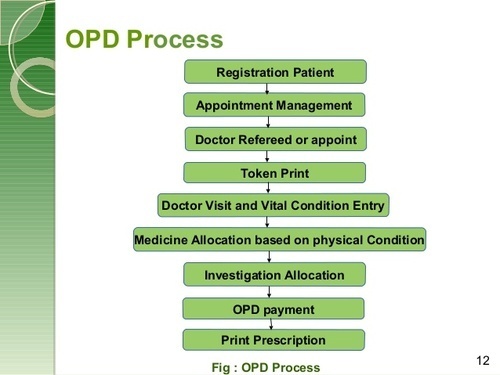 How OPDMS Will Help You In OPD Management? The OPD software module provides an electronic record keeping, data processing, and reporting/billing system within the OPD management practice and process followed by the hospitals during the entire treatment and cares time for patients. Stock Expenditure of Earning, Annual, Monthly, Daily, Reports.